Throughout its history, Stroud Tackle was more than just a retail fishing tackle shop. 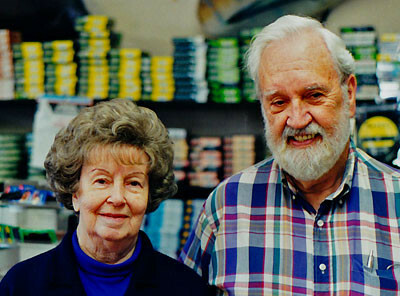 The little store front was the living embodiment of Bill and Eileen Stroud’s passion for angling and their desire to share that passion while serving the San Diego angling community. Bill Stroud grew up in New York and New Jersey during the Great Depression and for many younger friends and customers became a living connection to the events of the 1930s and ‘40s. Bill’s father met his mother in France during World War I and brought her back to the United States after the war. Bill’s connections to his french family led him to consider attending university in France; however, the outbreak of World War II scuttled those plans. Bill eventually joined the U.S. Army Air Corps and flew 31 missions over Europe as a flight engineer/gunner on B-24 Liberator Bombers with the 491st Bombardment Group (Heavy)/852nd Bombardment Squadron of the 8th Air Force. After completing his required missions and before returning to the U.S. to train B-29 crews he volunteered for a time on the Air/Sea rescue boats picking up downed fliers in the English Channel. After the war Bill raised horses and worked in the insurance and travel businesses in New York. Ever since undergoing training for the B-24 in San Diego during the war Bill had wanted to return to San Diego. In the early 1960s he relocated west to work in the insurance business and met Eileen, who reintroduced him to angling, a pastime he had not participated in since his youth. Throughout the ‘60s Bill and Eileen regularly rode the ½ day and ¾ day sportfishing boats out of San Diego, often multiple days during the week. In the late ‘60s Bill ordered some custom rods for Eileen and upon examining the delivered product decided that he could do better. Their passion for saltwater angling and Bill’s new found desire to build a better quality custom rod lead to the opening of Stroud Tackle on Morena Boulevard in October 1970. With Bill’s attention to detail and Eileen’s mastery of artistic diamond wrap techniques the shop’s business grew and the Strouds developed a reputation in Southern California for top quality custom rod work for saltwater anglers and later on for largemouth bass tournament anglers. In addition to custom rods and rod making components the shop stocked a full selection of rods, reels, lures, line, bait, and accessories. After a few successful years the Strouds began a transformation of the shop. Eileen grew up in Oregon the daughter of a logger and avid fly angler and steelhead fisherman. Her father began to teach her fly fishing and fly tying at an early age and thus fly fishing was part of her heritage. During the mid-1970’s the only fly shop in San Diego closed down. Bill had handled rod repairs for that shop and also built a few custom rods for them too. With Eileen’s fly fishing background and growing competition from new conventional tackle shops it was natural to begin the transition to a fly fishing specialty shop. By this time the membership of the local fly fishing club, the San Diego Fly Fisherman, had declined to only a couple of dozen trout centric members with little interest in local fly angling opportunities. Women were excluded from membership and as a result the club was faced with the loss of use of city owned facilities in Balboa Park and Morley Field. Bill and Eileen had wanted to join the club but Bill would not enroll because Eileen could not participate. However the city of San Diego mandated that the club be open to women in order to continue to use city owned facilities. Along with their transformation of Stroud Tackle to a fly fishing specialty shop, the Strouds began to infuse new life into the old club. Membership was opened to women. 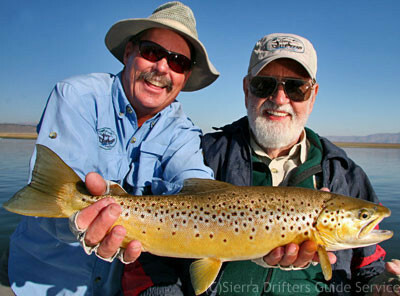 The club was renamed the San Diego Fly Fishers and began to incorporate a wide range of angling and conservation topics as well as free casting instruction into their programs. Stroud Tackle became the club headquarters and many customers signed up at the shop. The revitalized organization saw its active membership grow to over 300 individuals. Bill served a number of terms as president of the club and when not serving as a club officer was often an emcee or speaker at club events when he would enliven the events with jests from his seemingly endless library of jokes. Over the decades Stroud Tackle regularly donated raffle prizes for the club's monthly meetings and annual conservation fundraisers. The shop’s business continued to grow and attract customers from across Southern California. In addition to rods, reels, and fly lines, the Strouds stocked and extensive inventory of fly rod blanks and components and fly tying materials, vises, and tools. Bill and Eileen maintained an inventory balanced to appeal to anglers with budgets large and small. It was not unusual for Bill talk new customers and novice anglers into spending less than they intended on a new rod and reel and suggest putting their savings towards a guide so they could shorten the learning curve. For many years Eileen taught evening fly tying classes in the shop; hundreds of tyers learned or honed their skills in Eileen’s classes. 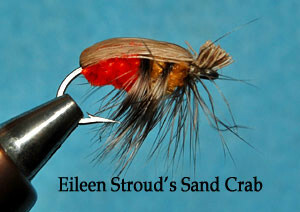 She also tied orders of custom flies not available from commercial sources for customers and her sand crab pattern, developed in the late 1970's, was one of the earliest patterns specifically crafted for fishing the Southern California surf zone. Bill continued to build custom rods, moving from conventional to fly rods. Although his custom rod building slowed down in the 1990s he continued to build a small number of custom rods and make rod repairs until 2011, his 90th year. As the new century came upon us the Bill and Eileen began to slowly reduce the shop hours to a schedule that they could handle with their decreasing energy levels even as a third generation of families began to patronize the shop. Eileen passed away in February of 2009 and the shop remained closed for a few months, but with the encouragement of close friends Bill reopened in summer of 2009 on a limited schedule. Initially unsure if the customer base would return, Bill was pleased with the return of old customers and the influx of new visitors to the little shop on Morena Boulevard. Bill was in the shop entertaining customers and friends almost every Thursday, Friday, and Saturday up until a month before his passing in late May 2012. Up until his last days in the shop he continued to amaze people by remembering the faces and names of people who had not been by in 20 or 30 years or more who would come by to see if the Strouds were still there. Today, the Stroud legacy lives on as a new generation of burgeoning fly anglers pass through the front door of Stroud Tackle, guided to the shop by recommendations from or tales passed on by parents, grandparents, aunts, uncles, and family friends who have graced the shop during the last 40 years.